Roy tries a rather unconventional way of using a Veritech to get Claudia to forgive him but it still isn’t working. Then he’s called to the crash of a space construction ship in the ocean near Macross Island. He calls the Lemurians for help, which may or may not have been a good idea. Not just because the Lemurians are divided over whether it’s a good idea to work with him but because the pilot is an old friend…and apparently knows Claudia too. Meanwhile, the Salamander is protected by Da Silva, who wants him to meet his employer. What they got right: The scene with Roy trying to use the Veritech to profess his love for Claudia was cute (although I have to wonder how Roy got away with it). We get to see the SDF-1 isn’t the only ship in the fleet and they’re still building new space cruisers. And more with the Lemurians. I wonder if they’ll get to play a big role before the license ends? What they got wrong: If Roy has to go to this extreme I’m starting to wonder if he isn’t better off without her in this continuity. And now we get a love triangle as well? I know Macross/Robotech has its soap opera elements as well but for me personally it’s getting old considering he didn’t do anything with Nina like she’s accusing him of. Recommendation: This issue is only interesting in that it sets up the next sequence of events. It’s not the issue to start on and is only helpful if you get the full series. 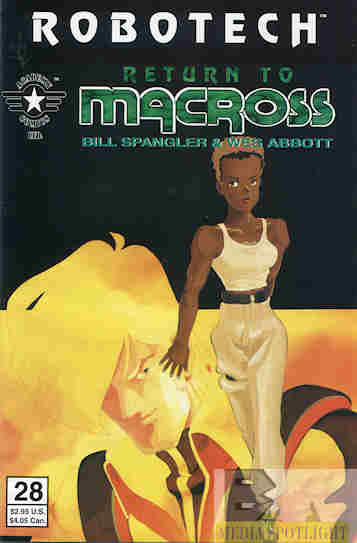 Posted by ShadowWing Tronix on December 7, 2018 in Animation Spotlight, Television Spotlight, Yesterday's Comics and tagged Claudia Grant, Robotech: Return To Macross, Roy Fokker. Why does Claudia look like Grace Jones on this cover?